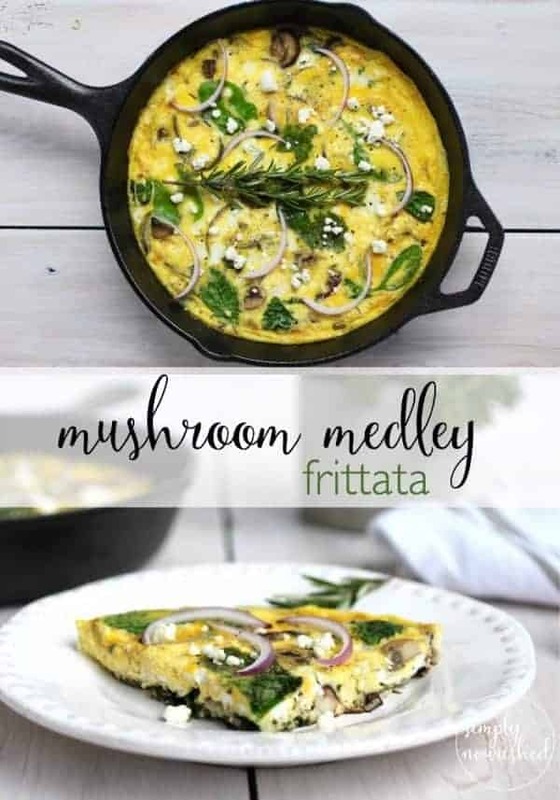 Add our Mushroom Medley Frittata to your Holiday morning breakfast menu! This recipe is a one-dish wonder and perfect for a holiday breakfast or brunch! It’s prepared with minimal dishes so cleanup is nice and quick. My favorite kind of recipe! I like to use a variety of mushrooms to add different textures and flavors but if you only have access to one or two varieties, that will do! 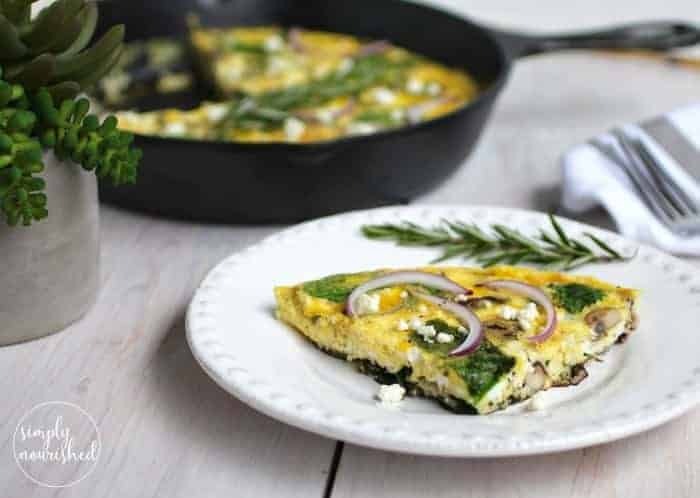 A soft goat cheese is a delicious and creamy addition in this recipe, however if that’s not your thing, go ahead and substitute your favorite cheese or omit the cheese altogether if you’re looking for a dairy-free/paleo option. 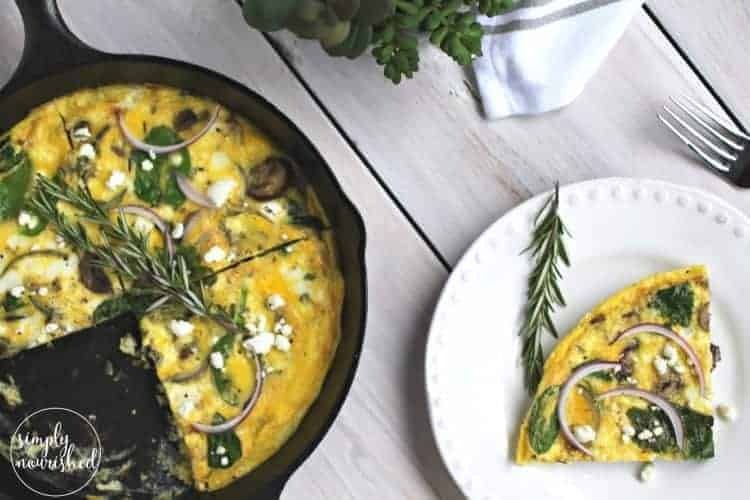 For the herbs, rosemary is my most favorite herb to use in the Mushroom Medley Frittata as the flavor pairs nicely with the mushrooms, eggs and red onion. However, basil, oregano, sage, thyme and dill are also quite tasty! Since my husband is not a ‘veggie lover’ per-se, I also make a ham and cheese frittata to serve along side this one (recipe coming soon). A Cast-iron skillet works wonders with this recipe. I used my 10 1/2 inch Cast-Iron skillet for this recipe. All of the steps can be done in the skillet from the stove top and into the oven. However, if you don’t have a cast-iron, a 9 x 9-inch glass dish will also do the trick. Recipe instructions below. Grain-free Berry Crisp and Grain-free Turkey Pot Pie are two additional recipes that are made in a cast-iron skillet. Season your pre-seasoned cast-iron skillet. Even though your cast-iron skillet may have come pre-seasoned when purchased, it’s still beneficial to season it to prevent sticking and to maintain durability and longevity. Here’s the method I used from The Kitchn blog: How to Season a Cast Iron Skillet. Mushroom Medley Frittata in the works. Mushroom Medley Frittata ready to be served! Breakfast is served! Gourmet meets simple with this recipe. Best of all, minimal dishes are needed so cleanup is nice and quick! Preheat broiler to high (550 degrees). Whisk eggs in a medium bowl; add salt and pepper and set aside. 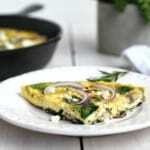 In an oven-safe skillet or cast iron skillet, place over medium heat. Add coconut oil or butter to the skillet. Once oil or butter is heated add mushrooms and red onion. Saute mushrooms and onions for 3-4 minutes. Add spinach and herbs and continue to saute for 30-60 seconds or until spinach begins to wilt. Top vegetables with goat cheese and eggs. Cook for 4-5 minutes on medium heat or until the edges begin to set. Finally, place the skillet under the broiler and broil for another 3-4 minutes or until center is just about set. Watch carefully so that you do not overcook or burn the eggs which can easily happen during the broiling process. Remove from oven, let set for 5 minutes and enjoy. **No cast iron or oven safe skillet? No sweat. Transfer to 9×9 dish after step 6 and bake in over at 375 degrees for 20-25 minutes or until center is set. Let us know if you add this recipe to your Holiday Breakfast or Brunch menu! This post contains affiliate links, which means we receive a percentage of the sale if you use the link to make your purchase. This does not change the price of the product. This income directly offsets the cost of web hosting and maintenance so we appreciate your support. Made this a.m. for Mother’s Day breakfast along with some fresh fruit. Very good!!! Highly recommend. !!! Thank you! What a great way to celebrate Mother’s Day.